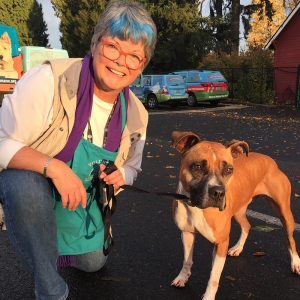 In the early morning hours of Thanksgiving day, volunteers filled the Oregon Humane Society. 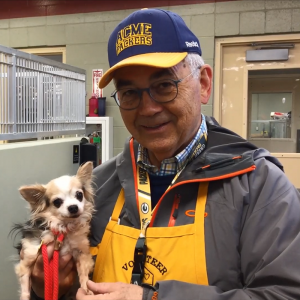 The shelter was closed to the public, but volunteers ensured that Thanksgiving was special for all the animals in our care. “I think the OHS spirit is highest on Thanksgiving, Christmas and New Year’s,” says Karl Keener, OHS volunteer. From 6:30 a.m. to 5 p.m., 64 volunteers spent their holiday with the pets at OHS. Volunteers were on hand throughout the day to walk dogs, socialize cats, exercise small animals and clean kennels. This is invaluable help to our staff who care for pets during the holidays when the shelter is closed. Interested in volunteering at OHS? Find out more about our volunteer opportunities. Karl Keener taking dogs for a walk on Thanksgiving. 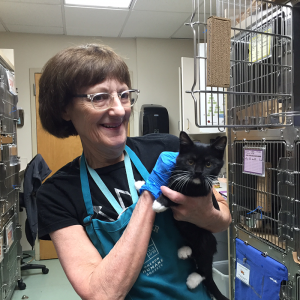 Volunteers like Joanne Hodgdon cleaned kennels and socialized with cats. Barb Berg was one of the 64 volunteers on Thanksgiving.